Spring Break has come and gone, you've probably spent all your money on a wild drunken party trip full of snorkeling and white shirt contests. Perhaps money well spent you now have an empty bank account and a boring house to come home to. Although penniless, you can still enjoy the feeling of jubilant one gets after sprucing up their home. You don’t even need to spend any money to give your house a makeover. 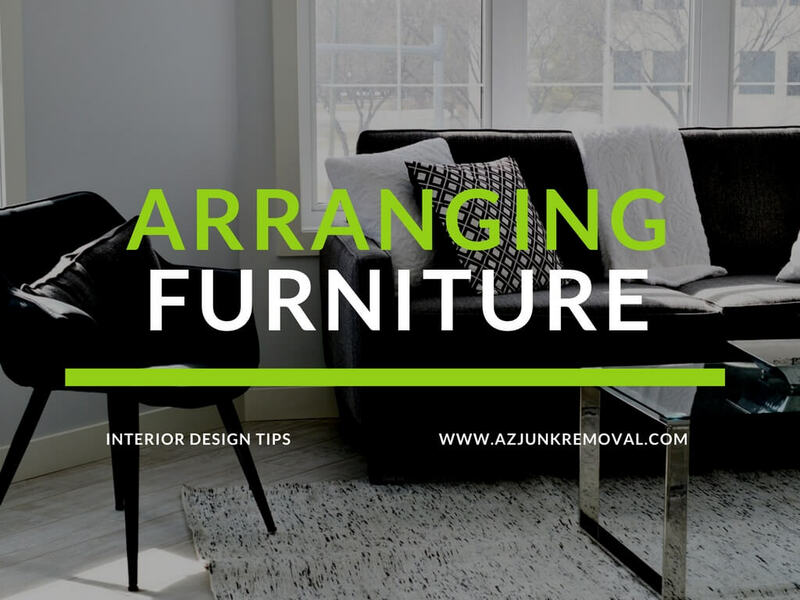 Instead of spending a bunch of money on new furniture and decor all you need to do is rearrange. You can start by emptying out your room completely, sort of like an artist’s blank canvas. Or you can be more like Van Gogh who famously re-used his canvases; the best part about this route is you don’t have to clear out the room beforehand. Genius. Decide on the focal point. For most of us that's the TV, but if you're really sophisticated then maybe your focal point is a large piece of art not an 8z11 piece but a large 4-foot by 6-foot monstrosity or a fireplace maybe even some large bay windows. Then, think about how you can arrange the furniture around that piece. Think about the purpose of your space, is it for hanging out with friends or hosting your boss and his wife at a dinner party. If it's for formal occasion arrange you furniture symmetrically, it sets a formal tone. If it's casual then just put that crap anywhere. Either way, start with the largest piece first. It's pretty likely that your largest piece is a couch. But like Patrick said, don’t put that baby in the corner. You might feel the urge to squish it up in the edges right up against the walls, But if you go this route your room is going to look stagnant. Instead float it out to the center of the room, if you don’t have enough space for then, place it along a wall but leave about 3 inches between it and the wall, this will make your room look larger. 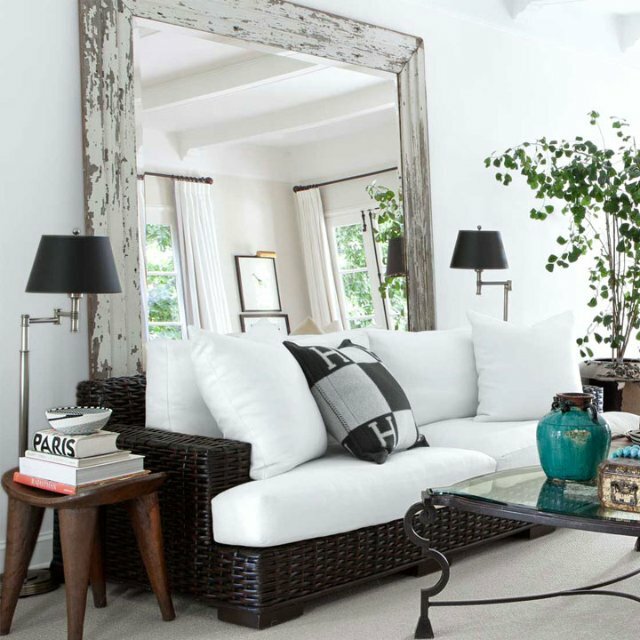 Place a few well-chosen mirrors in the room to add light and create the illusion of a larger space. A "few well-chosen mirrors" does not mean use mirrors as paneling, do not create a mirror wall. This is never a good idea. An over-sized picture frame mirror could be the exact thing your room needs to maximize its size. If nothing else, it will bring a whole new feel to the room. 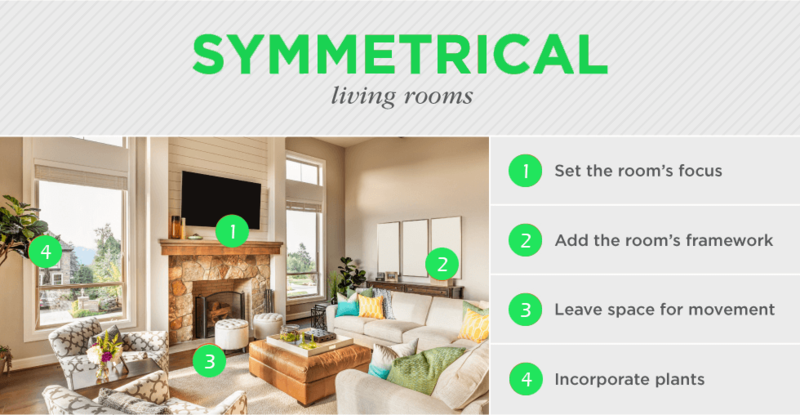 While not quite the same as reliving your tropical beach spring vacation, you can still enjoy the feeling of rejuvenation when you give your home new life. Just resist the urge to paint a beach scene on the wall. Palm trees don't belong on walls. That's another really bad idea.